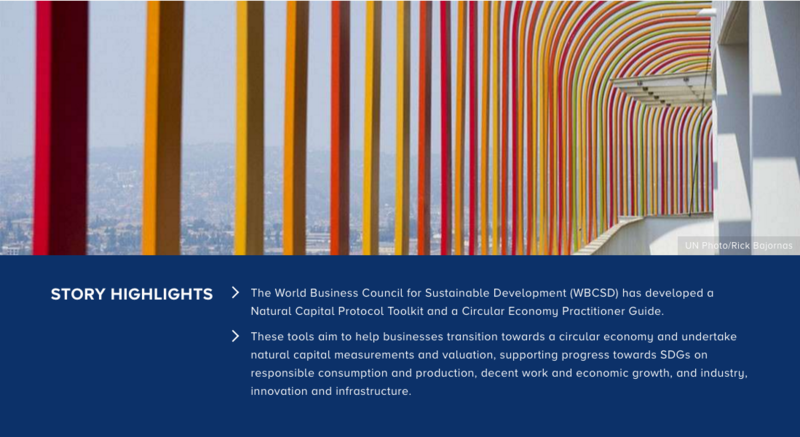 The World Business Council for Sustainable Development (WBCSD) has developed tools to help companies and businesses transition towards a circular economy and undertake natural capital measurements and valuation, thereby contributing to a number of the Sustainable Development Goals (SDGs), including SDG 12 (responsible consumption and production), SDG 8 (decent work and economic growth) and SDG 9 (industry, innovation and infrastructure). The ‘Natural Capital Protocol Toolkit’ complements and seeks to help companies implement the Natural Capital Protocol, a standardized international framework for conducting natural capital assessments that helps businesses understand which tools to use, for what and when, and address natural capital depletion by improving understanding, measurement and decision-making. The Toolkit consolidates tools, methodologies and approaches available for natural capital measurement and valuation, puts existing tools under the Protocol’s standardized framework, and links them into the process for conducting natural capital assessments. The Toolkit aims to help businesses measure a specific aspect of natural capital, such as water, waste or biodiversity.